Where Is The City Of Dubrovnik Located? This historic town is located on the southern part of the Croatian coast, in the region called Dalmatia. 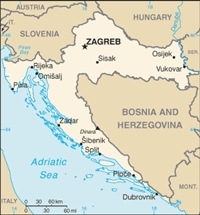 The Dubrovnik region encompasses a narrow band of the mainland and numerous nearby islands. To the north-west of Dubrovnik extends the Dubrovnik coastal area (Dubrovacko primorje region), with a whole string of friendly villages, of which the largest and most important is Slano. After that comes the Peljesac peninsula, the second-largest peninsula in Croatia. The historic little town of Ston sits at the very beginning of Peljesac and proudly boasts walls 5.5 kilometres in length. This area is known for its salt production and the cultivation of tasty shellfish. Just out from the coast of the Dubrovnik region there is a series of islands, beginning to the west with Korcula, Lastovo and Mljet and continuing with the Elaphite islands, of which the largest are Sipan, Kolocep and Lopud. The island of Korcula is the sixth-largest island on the Adriatic Sea. Its beautiful beaches and inlets, olive groves and vineyards and ancient island villages draw a great many visitors to this island. The island of Lastovo is one of the smaller populated islands on the Adriatic. The island offers beautiful inlets and beaches to all those who want to enjoy a holiday in completely untouched nature. The island of Mljet, thanks to its abundant greenery, is one of the most attractive islands on the Adriatic. There are two lakes on the island itself: the Large Lake and the Small Lake. Very close to Dubrovnik extend the Elaphite Islands, whose sandy beaches and Mediterranean atmosphere are a magnet for nature-lovers. Close to Dubrovnik extends the Zupa Dubrovacka, and along the coast of this region a series of beautiful tourist resorts: Kupari, Srebreno, Mlini, Soline and Plat. Konavle is the southernmost part of Croatia. This region is enclosed to the north by hills and to the south by the Adriatic Sea. It extends eastwards all the way to the Prevlaka peninsula and westwards to the small town of Cavtat. Cavtat is a picturesque Mediterranean town, whose charms attract a great many visitors.